It has been an exciting last year for Dammam Shipyard (DSY), strategically located in Saudi Arabia’s Eastern Province, close to the kingdom’s industrial heartland and the headquarters of Saudi Aramco. The yard, situated at the booming King Abdul Aziz Port of Dammam – one of the Upper Gulf’s biggest maritime hubs and the principal gateway to the Eastern Province and Riyadh – has experienced what Dammam Shipyard’s CEO Jason French describes as an “extraordinary uplift in vessel volume in 2014” after taking over the Lease, Operate, Transfer shipyard concession in June 2012. 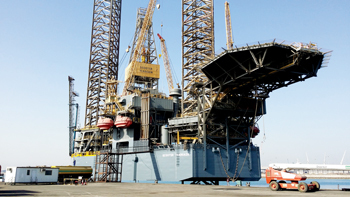 This year started in similarly positive fashion when Dammam Shipyard notched arguably its biggest achievement in the last two and half years when it completed the refurbishment and repainting of a jack-up rig for the US-listed drilling contractor Rowan Drilling. Entering the yard on February 4, Scooter Yeargain Rig No 55 was towed away and back to service at Saudi Aramco’s offshore Safaniya oil field in just 26 days. For DSY, the job was both historic and highly symbolic. The first rig to enter the yard for some 20 years, French expects it to be the first of many such projects as drilling contractors and offshore rig operators in Saudi Arabia realise the time and cost savings of carrying out work in a fully equipped yard, specialising in rig and vessel repair in the kingdom. As per the fleet status report issued by all listed drilling companies the lease rates for Scooter Yeargain are in the region of $180,000 per day. DSY says its competitive advantages in the rig refurbishment space are clear. For one, if the rig remains in the kingdom, there is no need to cancel Saudi Aramco work permits, which would be the case should it be moved even temporarily out of country. 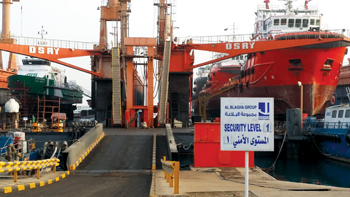 By keeping the equipment in kingdom, Saudi Aramco also benefits from full access to the Port of Dammam – DSY yard to monitor work around the clock and can, if required, perform on hire inspection on site to expedite the process. All in all, DSY estimates the entire saving for rigs leaving Saudi waters is 13 days – time which has the potential for delaying key Saudi Aramco projects. French says with the Scooter Yeargain project DSY is knocking on the door of the “Premier League of Arabian Gulf shipyards”, joining a club which includes established competitors in the jack-up sector such as Dubai Dry Docks, Lamprell’s Sharjah facilities and Arab Shipbuilding and Repair Yard (Asry) in Bahrain. Part of the diversified Riyadh-based Al Blagha Group, specialised in running large marine infrastructure assets in the Middle East and North Africa (Mena) region, DSY looks well placed to build on its foundations as an Aramco-approved contractor to support the kingdom’s and region’s marine and oil and gas industries, and in particular the servicing, repair and upgrading of jack-up drilling rigs. The yard also has a proven track record in the repair and refurbishment of dredgers, anchor handling tugs (AHTS) and platform supply vessels (PSVs) supporting the oil and gas industry in the Arabian Gulf. The 23-hectare site in the King Abdul Aziz Port of Dammam offers two floating dry docks – one 215 m long with a 22,000-tonne lifting capacity, and the second 165 m long with a 10,000-tonne lifting capacity which can handle most vessel types in the Upper Gulf. A fully equipped 600 m linear quay can accommodate up to five jack ups rigs, for repair/refurbishment or cold stacking. French notes that the yard, in conjunction TUV Nord of Germany, obtained full certification to ISO 9001, 14001 and 18001 standards, reflecting its zero compromise approach to quality, environmental protection and occupational health and safety. French stated that DSY is also pursuing API (American Petroleum Institute) Q1 certification, and AS9100 (Aerospace and Defence) continuing with their quality management system’s continual improvement. 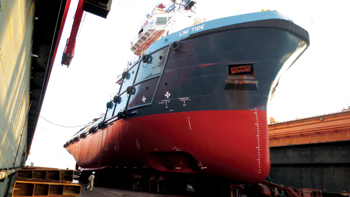 Currently, the yard is focused on five core services – hull maintenance (structural steel)/piping installation, mechanical and electrical services (including HVAC), specialised blasting and painting (including corrosion and passive fire protection through a joint venture with Muehlhan, the international corrosion protection and surface coating leader), on site machining, and specialised labour services (tank cleaning/demolition and removal). Going forward, DSY’s success will also increasingly be a function of strategic partnerships with specialist international firms, a fact illustrated by the joint venture signed with Muehlhan in November 2014. The resulting joint venture, Muehlhan Al Blagha Saudi Arabia (Mabsa), draws on the global reach and expertise of the Germany-based Muehlhan Group, which with more than 30 subsidiaries in Europe, North America, the Middle East and Asia is considered one of the world’s largest paint application firms, offering customised solutions for corrosion protection and surface coatings. Mabsa is currently bidding for a number of large blasting and painting projects across the kingdom, including new projects with Saudi Aramco. Other examples of DSY’s upgraded competencies and partnerships was a co-operation and manpower supply agreement it signed in late 2013 with international engineering, procurement, construction and installation (EPCI) giant McDermott International. The latter now has a facility within the Dammam Yard from which it will support Saudi Aramco EPCI services and projects. These developments are all part of a measured expansion plan implemented by the Dammam Shipyard team to support the oil and gas industry and keep rigs in the kingdom . Going forward, DSY says it will continue to pursue opportunities to support Saudi Aramco, as drilling companies based in the Gulf, EPCI contractors and vessel operators. Having inherited 240 Seaman from the previous concession holder, Dammam Shipyard have over the last 18 months fully replaced Seaman with highly experienced professional staff and introduced a Saudi graduate training programme to meet future demand for expertise. French is currently spearheading a recruitment campaign which, now in its second phase, will soon see staffing levels rise to 500 personnel, from 350 at present, supported by the highly targeted hands-on training programmes to ensure all personnel are qualified according to its client’s need and market demand. Once this phase is complete, DSY will be in an even better position to build on its burgeoning, and thoroughly deserved, reputation for providing vessel and rig repair services within Saudi Arabia, with all the cost savings and logistical advantages that implies.